Yesterday, the USAF launched the fourth mission of its unmanned X-37B, which looks like a miniature space shuttle, from the Cape Canaveral Air Force Station. During the X-37B’s last mission it stayed in orbit for a record 674 days performing a number of classified projects. According to the Washington Post, among the projects of the current X-37B mission that the USAF has revealed is the testing of new thruster technologies that will help keep U.S. satellites safe from potential enemies. Also included in what is known about the X-37B mission is that it will deploy tiny solar-sailing spacecraft on behalf of the Planetary Society. Space.com reports that most of the mission’s activities, however, are classified, including where it will be orbiting and how much time the X-37B will actually spend in space. Also known as Orbital Test Vehicle 4 (OTV-4), the mission is believed to be demonstrating technology for future programs. One of the experiments aboard the spacecraft which has been publicised by the US Air Force consists of a Hall effect thruster for the AEHF series of communications satellites, allowing performance-enhancing modifications to be tested before they are introduced on operational missions. Basically the X-37B will help develop improved propulsion systems that can be used in communication satellites, and eventually other spacecraft. 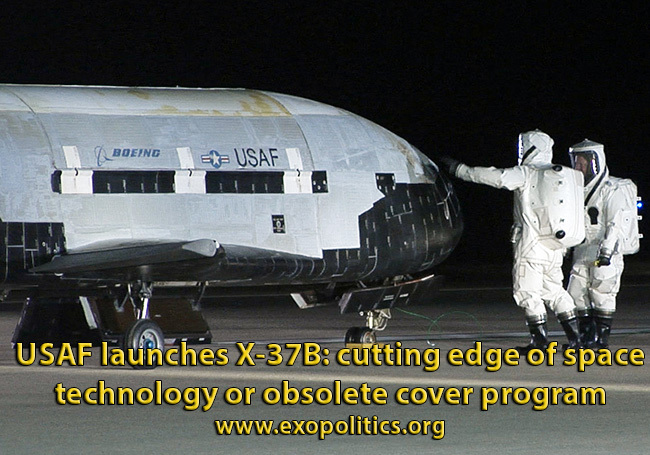 If the USAF and NASA is correct, then the X-37B is at the cutting edge of helping develop new propulsion technologies. 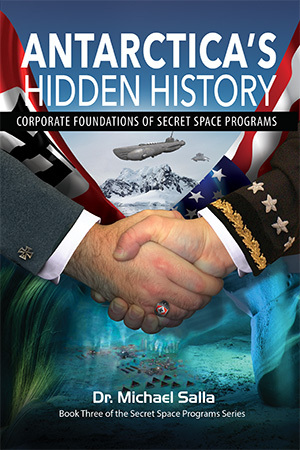 Not so according to Corey Goode, who claims to be a whistleblower revealing his experiences with several highly classified space programs that he served in over a 20 year period from 1987 to 2007. 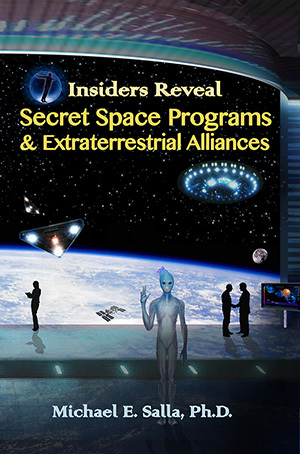 He claims that programs such as the X-37B are merely covers for more secretive programs that use far more advanced propulsion technologies such as antigravity, than the obsolete thruster rocket systems used in the X-37B, military satellites and other classified space vehicles. Those that are in the National Military Black Op’s Programs are not read into the full picture of what is going on. They are given various cover stories and told that the things they track are our technologies from other black programs. They are spending trillions of dollars on lower technology that has its roots in the 19th/20th centuries with mainly advances in electronics and material sciences. Those who fly manned space planes that sometimes dock with the ISS and other secret space stations of lower tech programs sometimes observe craft that they are not supposed to and they are debriefed and sworn to secrecy usually knowing more about what is going on in outer orbit than their commanding officers. These personnel are often pulled into the Advanced Secret Space Programs once they reach a certain amount of first hand experiences. On Oct 10, 2014, Peter Maass and Laura Poitras writing for The Intercept, released powerpoint slides from leaked NSA documents concerning highly classified programs that are hidden from public scrutiny. 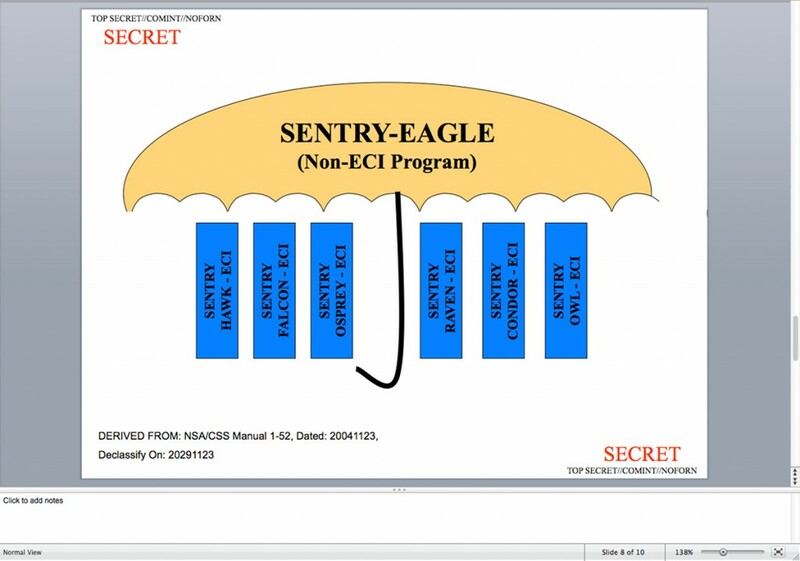 The documents, originally leaked by Edward Snowden, reveal that “Sentry Eagle” is used as an umbrella term for hiding the NSA’s most sensitive programs that are classified “Exceptionally Controlled Information” (ECI). Several powerpoint slides show how ECI programs are hidden beneath less classified programs as a cover. If Goode is correct, then spacecraft such as the X-37B using conventional propulsion technologies may indeed be cover programs. While Goode has not yet supplied any documentation to support his remarkable claims, a number of independent researchers have cited confidential insiders that support his credibility. Among them is David Wilcock author of a number of New York Times best sellers. If the USAF is to be believed, the X-37B is at the cutting edge of developing new thruster propulsion technologies for vulnerable military space satellites. If on the other hand, Goode is to be believed, the X-37B and other military spacecraft using similar propulsion technologies are obsolete covers for more highly classified space programs using antigravity and other exotic propulsion systems. Did Hillary Clinton sell Secret Space Program technologies to China?